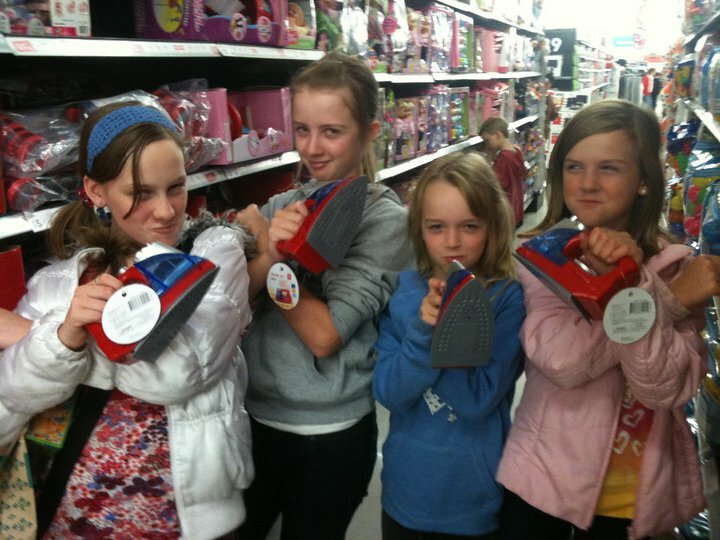 Enlighten’s Catherine Manning, one of our Melbourne workshop presenters, was in the toy aisles at K-mart last week with her two daughters and two nieces, ranging in age from 8-12. 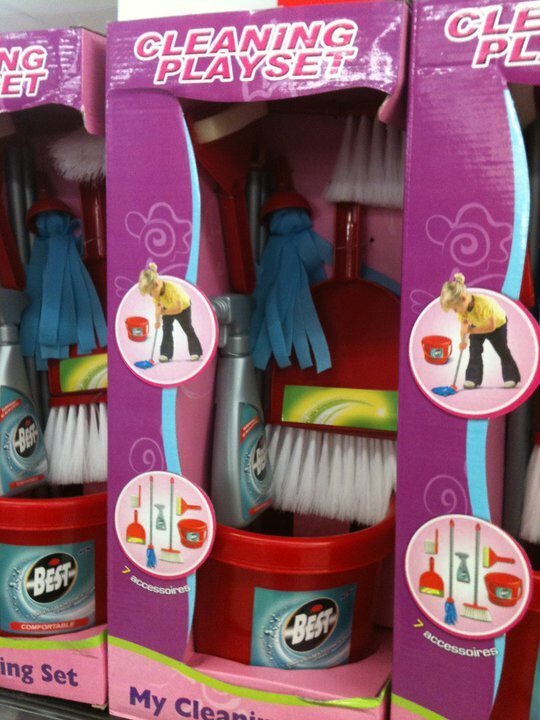 In the girls toy section, Catherine was appalled to see a whole row of “My Cleaning Set.” Inside the glossy pink packaging was a mop and bucket, broom and—hold on, don’t get too excited—even a dustpan and some cleaning spray! Just as Catherine was contemplating buying one so she could discuss it with teen girls in her Enlighten workshops, something awesome happened that has got all of us here at Enlighten smiling: Catherine noticed that her daughters and nieces were standing further down the aisle, holding toy irons, with indignant looks on their faces. Left to Right: Mietta, Eden, Sasha and Lucinda. When you look in the girls aisle it’s all just pink, princess stuff, and boring cooking and scrubbing products, but the boys get fun building stuff, and puzzles and cars. I still don’t know why marbles, puzzles and mighty beans are in the boys aisles. The girls toys make little girls think they are the maids and they’re in prison and they serve the boys their food, massage their smelly feet and look after them and serve them breakfast, lunch and dinner! It isn’t fair that boys get all the fun, and we get all the house jobs. When I think about being an adult, I definitely would like to think that my future partner would think that they’re NOT just jobs for girls! 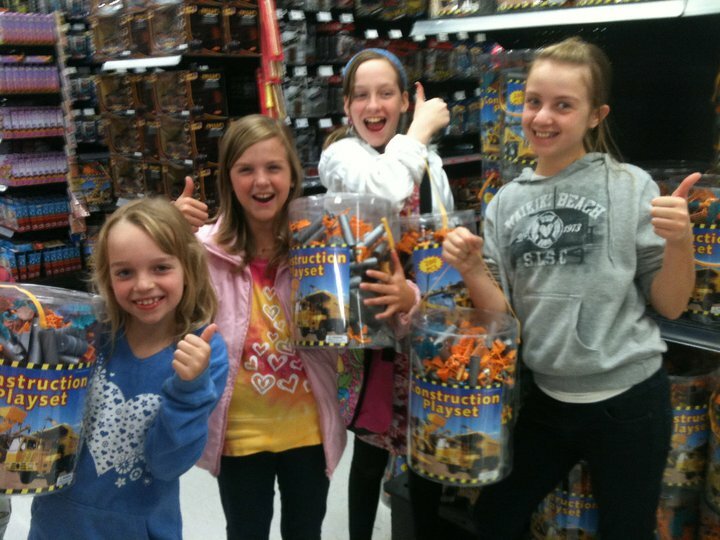 I would love to see some girls toys that lets girls be creative and constructive. This could be like building something like a dolls house, or a billy cart, or just other fun stuff. The dolls are always dripping with makeup. It makes me feel like I’m supposed to look like them, and it makes me feel a bit sick. I think that girls are being taught that they should ‘prepare’ for when they are older, because ladies do cooking and cleaning for their families while the men go outside and actually do FUN stuff! I think the boys are laughing at us because they think that’s how it’s gonna be too! Lego is soooo fun! I love building random, weird stuff! Me and my younger brother recently built this MASSIVE skyscraper thing! If there are any toys that are girls or women, they have hardly any clothes on. My brothers dressed up as fairy princesses last week—have you stopped to think that they sometimes like to play ‘girl’ stuff too! I think it’s very interesting that all the girls feel that girls and boys should be allowed to choose what they want to play with, not have it foisted upon them because of their gender. Indeed, the problem isn’t inherently that there’s anything wrong with playing with a mop or an iron, but that thanks to marketing, packaging and the way the store displays its merchandise, kids and adults alike get the message that girls should clean and boys should build stuff. Look closely in the background of that picture of the Amazons brandishing those plastic irons and you’ll see that Catherine’s son Jem in fact looks pretty interested in something in the “girls” aisle. I have known kids to enjoy playing with these toys but only because at a certain age they like to imitate adults . . . it wouldn’t have killed them to put a boy on the packaging as well, but the reality is probably that it is mum kids see doing the housework most often = THAT’S the problem! Toy companies and stores would be smart to take notice of girls such as Lucinda, Eden, and Mietta, though—because we’ve all had enough of gender stereotyping. With that in mind, I have a fun activity challenge for you this school holidays: encourage your daughter to design a toy that will accurately prepare girls for life as a successful woman! I would love to post the results here on the blog. She can make a drawing and scan it, or even build a model then take a photograph of it. Then email me the scan or the photo, and I’ll publish it here! My email address is: danni@enlighteneducation.com. Entries close 20th May. The most creative entries we receive will win copies of our inspiring Enlighten posters so do make sure you also forward your contact details. I do love this post, although I have to say that my FAVOURITE toy when I was a little girl was my mini (bright bright bright pink) washing line. Every single Monday I would diligently wash my dolls clothes and hang them up to dry. HOWEVER I also played with kinex (I think it was called that? It had wrenches and bolts and stuff. I also played with a lot of lego. In fact, most of the toys my brother had, I also insisted on playing with. Inclusive of spacemen, safari persons, farm sets, etc. I was the ultimate pink-child. I still am. But I thing variety is really important in toy sales! It is interesting to reflect on what we loved as small girls isn’t it Ella? I ADORED Barbie, Cindy ( a version of Barbie with a larger head and less cleavage) and The Sunshine Family ( a family of hippies with leather sandals and a craft gallery). In hindsight, it wasn’t Barbies shoes and outfits , nor her Laundry, Kitchen etc that excited me at all…it was playing at grown ups. Having power! Making decisions! Designing small worlds which I then ruled! I can assure you Babs spent NO time doing laundry in my world. She was far too busy hoping into my dad’s sneakers ( they were creatively used as her sports cars) and zooming off to organise art exhibitions etc at The Sunshine Gallery ( the Sunshine Family were artistic in my worlds yet commercially clueless). I did also adore my Wonder Woman and Bionic Woman action dolls…so perhaps I was playing at creating an Amazon Army / building a Girl Power business despite all the pink packaging I had to wade through to get to the main game. I agree completely it was about power and playing grown ups – I was an only child for my first five years, went to preschool only one day a week and while I had friends over, I was definitely born into an adult’s world! When I was maybe 13 or 14 the Sims came out – which for those of who don’t know is a computer game where you create virtual families and ‘control’ them – very much like playing dolls houses on a computer. I LOVED that game and it was very much in the same vein. These girls are awesome! When I was little I couldn’t for the life of me work out what you were meant to do with dolls. I even remember screwing up my face and giving my grandma the silent treatment when she bought me one! For me it was all about seeing how many gory scabs and scars I could get while running around outside. Kids all have their own individual preferences and it’s a pity to think that they should be stereotyped one way or the other. Lucinda, Eden and Mietta, I loved reading your comments and I think it is wonderful you took the time to write such articulate and thoughtful letters. I hope K-Mart takes your advice on board when selecting toys in future and next time I shop there is a ‘top toys’ section instead of separate girls and boys aisles. Why don’t they separate the toys into interest areas (eg ‘building stuff’) instead of by sexes? Dannster, the toy challenge is a great idea. I look forward to seeing the results! Great post that simply reinforces what so many women and men, boys and girls are concerned about – the way the marketing of products like toys (but many other things) is so imbued with reductive gender ideologies, all of which construct such a narrow idea of girls and boys identities – identities which should be rich, complex amd varied. Mietta, Eden, Sascha and Lucinda, thank you so much for writing to K-Mart amd expressing your concerns in such clear and passionate ways. I hope they respond in writing but, more importantly, by making real changes. Danni, can’t wait to see the results of the competition. warmest wishes to all of you and a big thank you! What clever, clever girls you are!! Congratulations on making a statement for so many other girls as well. As a little girl, i played lots of “boy games” because i had three big brothers with lots of friends who only played footy, cubbies, war and chasey. It was loads of fun. I did grow up making statements about not cleaning or cooking as i had never seen my brothers doing any of these things. It was great having no girl boundaries. Because i have 3 boys of my own i haven’t done alot of cruising down the pink aisles but when i do i have to say it looks very sanitised and a little bit boring. We as girls are so much more interesting and diverse. We are clever and creative. Good on you girls for your fantastic letters and good luck! My daughter, who is 4, recently discovered Lego Hero Factory, which has a female protagonist robot named Natalie Breeze. She was so enthralled with this Lego robot that I went ahead and bought her the kit. She’s now obsessed with Legos (to her father’s great delight)! Oh My Gosh I love this!! I read a blog from Pigtailpals.. inspired me to write my own… http://www.mandicandipurses.blogspot on how media is affecting our children..our parenting. I never understood the laundry facilities sets either.. the kitchen ones.. yeah.. cooking is fun.. but laundry.. UGH!!!!! You may as well market the Tax Return business play set or Payroll play set.. hey maybe I am on to something here!!!! I disagree that the toy shown is a boring toy. I have worked in early childhoods for over 20 years. Little kids around the age of 2-6 love to play with miniature versions of adult stuff. Would you have said it was boring if it was a miniature tool set? Kids like to do what they see parents doing. All parents have to do housework right? I think the problem as you said in the post, is that it was marketed to girls. A friend of mine bought a similar set for her 4 year old son and he loves it. May I just say that princessy and girly stuff might actually appeal to some little children . Don’t assume they like it just because it’s in the girls section . You’re right, there are plenty of little girls that like pink, frilly, princessy toys, however that’s all that seems to be aimed at little girls. You even call them “girly”. Why are they girly? Is there something wrong with little boys wanting to play with princessy toys? There shouldn’t be. As Mietta wrote in her letter above- “Why do you even need to have a ‘boys’ and ‘girls’ aisle? Why don’t you mix them up so we all get to look at different toys and decide ourselves what we should play with.” That right there is the whole point. Let the kids decide for themselves what they want to play with. There shouldn’t be just boy or just girl toys. I dont think its a boring toy either and when you take away the pink packaging its nice primary colours so I would buy it. My 3 year old son loves cleaning up (unfortunetly not as much as he likes to make a mess) and has a sweeping brush. He is also obsessed with the washing machine so has a toy washing machine too. Marketing these things just to girls is as limiting to boys as it is to girls. My little brother is 4 and although he does love playing with lego and Lightning McQueen, he also loves painting his toenails red, dressing up in fairy dresses and his favourite game is playing “daddy” with baby dolls. At school he loves playing shop keeper, cleaning with the toy vacuum and the gardening/building tools. As a child myself, i would play imaginary games with my Bratz dolls where they were fighting against evil enemies and had major attitude problems. Although I asked Mum for a Hot Wheels set for Christmas (which was cheaper than a doll! ), it never came! Therefore I do agree that to an extent the marketing of childrens toys is targetting a particular gender.